Robin Sloan, the author of wonderful novels like Mr. Penumbra’s 24-Hour Bookstore and Sourdough, also spends his time messing around with neural nets that compose and transform language in delightful ways. His latest experiment? 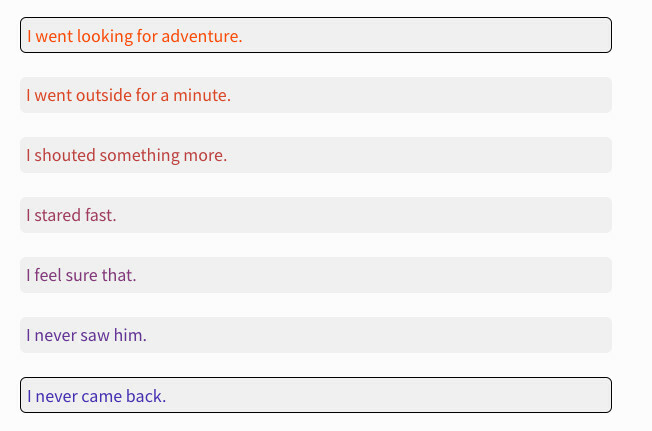 An engine that lets you input two sentences -- and it generates a "sentence gradient": i.e. a bunch of plausible sentences that gradually slide from the meaning of the first one to the meaning of the second one. So, does that sentence gradient make sense? I honestly don’t know. Is it useful? Probably not! But I do know it’s interesting, and the larger artifact—the continuous sentence space—feels very much like something worth exploring. This is pretty mesmerizing, I gotta say.